Celebration Breads by Betsy Oppenneer is available in book form on Amazon.com. Every culture celebrates with food. And no food has a greater influence on culture, history, or religion than bread. From the unleavened matzo of Passover to the German stollen of Christmas, from the British hot cross buns baked on Good Friday to the Russian kolach baked for any special occasion, bread in its many forms brings people together, linking traditions and generations. Bread is Betsy Oppenneer’s passion. A renowned cooking teacher, she has spent most of her life baking, and much of it traveling. 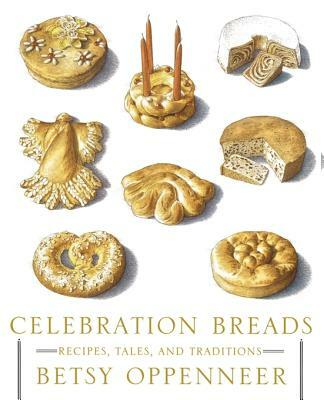 Celebration Breads: Recipes, Tales, and Traditions is a collection of more than 75 sweet and savory breads from around the world — from the Americas and Western Europe to Africa and Russia. From her anecdotes about the history and traditions associated with the breads, you’ll discover the tradition behind each recipe. Christmas breads from Czechoslovakia, Switzerland, and Egypt; traditional New Year’s Challah from Eastern Europe; and Easter bread from Poland are just a few of the recipes for breads made to celebrate well-known holidays, but Betsy has unearthed many more. Bread lovers will be eager to prepare such recipes as Bread of the Dead, a bread from Mexico made in honor of the Day of the Dead; and Scalded Bread, traditionally baked in Lithuania in preparation for marriage. No matter what the occasion, Celebration Breads has the perfect recipe for you. Teacher that she is, Betsy wants all bread bakers to succeed, whether they’re baking their first loaf or their hundredth. Each recipe is laid out in painstaking detail, with instructions for making the bread by hand, with a heavy-duty mixer, using a food processor, and by using a bread machine (if possible). Betsy provides comprehensive chapters on: Bread-Baking Ingredients and Equipment; How to Make Bread (including the 4 Basic Rules of Bread Making); Essential Tips and Techniques for novices and experts alike; a Sources list; and an extensive Bibliography. Betsy even includes a section on Homemade Candied Fruits, in which she provides instructions on how to candy your own fruit and citrus peel to obtain a truly authentic product. With more than 70 black-and-white line drawings by John Burgoyne (known for his work for Cooks Illustrated magazine), Celebration Breads is an invaluable addition to the bread-baking bookshelf.